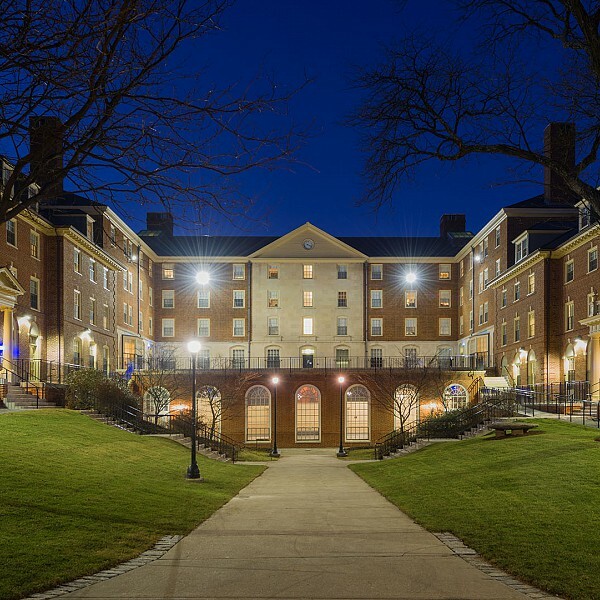 Description: This design-build residence hall project comprises the comprehensive, phased renovation of two low-rise, historic dormitory buildings and the partial renovation of a third dormitory building totaling approximately 72,000 sf. The design of a new central hot water plant for the complex consists of a shell-&-tube steam-to-water heat exchanger and two primary hot water circulating pumps with variable frequency drives (VFDs) connected to generator power. Hot water is distributed from the hot water pumps via an insulated piping distribution system to perimeter radiation, ventilation and heat recovery unit, and miscellaneous heating units throughout the building. Mechanical supply ventilation is provided for the corridors and other occupied areas where natural ventilation cannot be provided, and ventilation for bathrooms and trash rooms will be provided mechanically by an energy recovery ventilation unit. Additional systems include a new water meter and reduced pressure backflow preventer, two new hot water sources, electrical service with a new 120/208-volt three-phase four-wire 400 ampere feeder, and new high-efficiency lighting.